India achieved record annual GDP growth, averaging 8.45%, in the five years, 2004-05 to 2008-09. But was this inclusive, and did it benefit the poor masses? We have no data on poverty beyond 2004-05. But the CSO has current data on the economic growth of the states. Historically, the chronically poor states were Orissa plus the BIMARU quartet (Bihar, Madhya Pradesh, Rajasthan, Uttar Pradesh), of which three have been sub-divided. Have these eight poor states participated in India’s boom? Yes, absolutely. Indeed, five of India’s eight ultra-poor states have become miracle economies, defined internationally as those with over 7% growth. The best news comes from Bihar, historically the biggest failure. From 2004-05 to2008-09, Bihar averaged 11.03% growth annually. It was virtually India’s fastest growing state, on par with Gujarat (11.05%). That represents a sensational turnaround. Nitish Kumar deserves an award for the most inclusive revolution of the decade. Other poor states have done very well too. Uttrakhand (9.31%), Orissa (8.74%), Jharkhand (8.45%) and Chhattisgarh (7.35%), have all grown faster than the standard miracle benchmark of 7%. Orissa’s performance is remarkable, since 10 years ago it had the worst fiscal indicators among all states. Naveen Patnaik has been a major force in accelerating growth and stabilizing state finances. His image as a clean politician has been tarnished recently by reports of widespread corruption. Land acquisition problems and Maoist violence have highlighted continuing tribal travails, and the murder of Christians is a blot on his secular record. Yet, he deserves kudos for making Orissa stage a huge turnaround. The elephant in the room has always been Uttar Pradesh, a huge, poor state of almost 200 million people. The excellent news is that UP’s growth rate has risen impressively to 6.29% annually. This falls short of the miracle benchmark of 7%, but not by much. UP has benefitted from overall buoyancy in the Indian economy. In NOIDA, it has created a major services production and export hub, and an auto hub, too. Sugar factories have expanded fast. Growth seems to have accelerated a bit after Mayawati came to power, but it is too early to credit her with a paradigm shift. Something similar can be said of Raman Singh in Chhattisgarh. Rajasthan, which grew fast earlier, has slipped down a bit, to 6.25%. 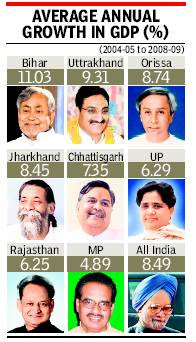 The most disappointing performance comes from Madhya Pradesh (4.89 %). So, not all poor states have joined India’s growth bonanza. But the overall picture is very heartening. Of the eight historically poor states, four -Bihar, Uttrakhand, Orissa and Jharkhand - have grown as fast as or faster than the all-India average of 8.49%. We must qualify this story. Fast growth in poor states does not automatically mean that growth has reached all poor people. Major beneficiaries include a creamy layer of politically well-connected people, exemplified by the Koda scandal in Jharkhand. The spread of Maoism suggests widespread tribal distress. However, agricultural growth in 2004-09 averaged 4.4% per year, the highest in any five-year period, benefiting the rural masses. The minimum wage was raised in most states, and doubled by Mayawati to Rs 100/day in UP. Rural employment and infrastructure schemes, plus the telecom revolution, added to rural dynamism. After two decades when incumbent governments were regularly voted out at elections, several incumbents have recently been re-elected. This suggests mass-based satisfaction in place of the earlier dissatisfaction. Rainfed states experience enormous swings in growth depending on the monsoon, and can swing to negative rates in a bad year. So, averaging growth rates over five years is sometimes not enough to establish a trend. In Bihar, GDP actually declined by 5.15% in 2003-04. So, if we average its data over the last six years rather than five years, its growth rate drops to 8.33%. This is still a stellar performance, but no longer on par with Gujarat’s. At the other end of the spectrum, Rajasthan had a spectacular 28.67% growth in 2003-04. So, if we average data over six years instead of five, Rajasthan’s growth rate gets revised massively to 9.99%, an excellent performance. The poor states remain far behind the rest of India. Maoism, terrorism and corruption are growing. Yet, the economic gap between some poor and rich states is shrinking dramatically. Let us celebrate the emergence of Bihar and other poor states as miracle economies. This is surely one of the biggest achievements of the decade. Bihar needs Nitish Kumar all the more now. The flame he has ignited needs protection from the political rivals determined to shove Bihar back to the ditches of Poverty. May Nitish win again, and may this flame of development never die.